Enjoy the indulgence of a Big Mac and the comfort of a home-cooked meal with these fun-as-Fry Guys sliders. 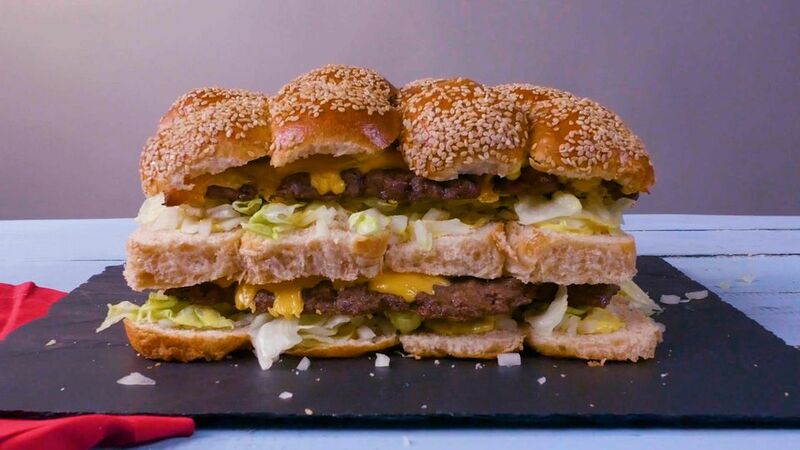 Just like the McDonald’s favorite, these pull-apart burgers feature two layers of all beef patties, special sauce, lettuce, cheese, pickles, onions—all on a sesame seed bun. These two-bite burgers are perfect for parties, or serve them alongside crispy French fries for a classic, all-American meal. In a large bowl, combine beef, breadcrumbs, salt, pepper and garlic powder. Divide into two portions, and place mixture on two baking sheets. Gently press mixture to form even layers. Bake for 13-15 minutes. Top each beef layer with cheese slices and bake again briefly until cheese has melted completely. While the beef cooks, make the sauce. In a medium sized bowl, whisk together mayo, yellow mustard, relish, white vinegar, garlic powder, onion powder, paprika and salt. Lightly toast the buns and then cut crosswise into thirds. Spread special sauce along the bottom buns. Top with shredded lettuce and onion. Add one layer of burger patties and top with the middle section of buns. Repeat previous step; add pickles before finishing with sesame seed bun tops. Slice into thirds both crosswise and lengthwise and serve.